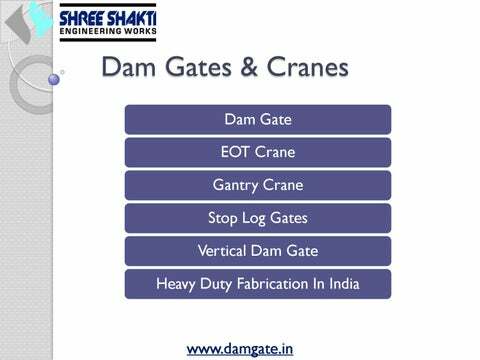 Dam Gate As the name itself denotes that they are used in dams so they are called dam gates. The material we use in fabricating the gates is top best grade to ensure safe handing and managing of the water level. The dam gates are made in standards dimensions and are even customized as per the need of the customer. Gantry Crane The gantry crane is mostly used in shipyards, warehouse, etc to lift heavy container from ship to ground.They have a overhead bridge and is mounted on two or more legs that provide support to the bridge. The bridge has a hoist that performs the task of lifting and shifting the heavy load and machines. Stop Log Gates Stop Logs gates are used in flood control operations. They are hydraulic control elements that are used to adjust the water level to be discharged into canal, rivers or reservoirs. They are long rectangular beams that are placed one over the other and are added or removed to handle the water level. These gates make it easy to handle the flow of water in any emergency condition. The stop log gates are made from top grade materials to make them durable and effective in performance. Vertical Dam Gate The vertical dam gates are used in the dams to control the level of water in the dam. They are designed to provide the best safety and adjustment of height of water stored. 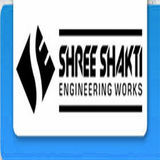 We use highest quality materials in fabrication and rank as vertical dam gates manufacturer providing reliable services and performance. They are designed as per industrial and customer required specifications.